A park jointly owned by all residents. Plant a tree or flowering shrub on your own site. It's your park - you will never be turned away. (The growing popularity of camping has created congestion and confusion at many public park areas...why not enjoy your very own!) 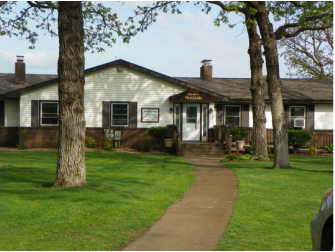 There is an apartment attached to the club house providing year round residence to ensure privacy and protection during the off season. More Fun and Relaxation... A Better Place For You! You'll love what you see when you drive into the park. Feast your eyes on the rambling, rustic clubhouse. A massive brick fireplace social area furnished with easy chairs for gracious visiting, greets you as you enter the Club House. There is room for all types of activities: card playing, large social hall for park dinners, dances, family events, etc. Convenient laundromat. Take a dip in the beautiful NEW heated swimming pool! You'll enjoy “roughing it” at Travelers Country Club!